FOR most, planes mean freedom, adventure and excitement, but for Chris Dawson, yesterday's plane ride flew him closer to a murder charge. The former professional rugby league player and physical education teacher is accused of murdering his wife Lynette Dawson in 1982 in the Sydney suburb of Bayview. About 8am on Wednesday, 37 years after Lyn went missing, Dawson was arrested at his stepdaughter's Biggera Waters home and taken to the Southport watch-house. 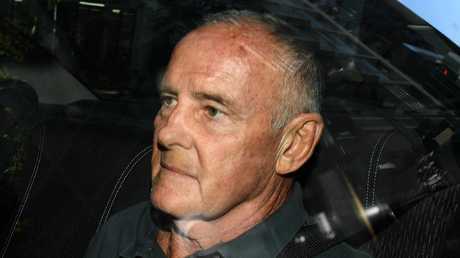 He was denied bail by Queensland magistrate Dennis Kinsella and his extradition to Sydney, under the custody of NSW detectives, was ordered. 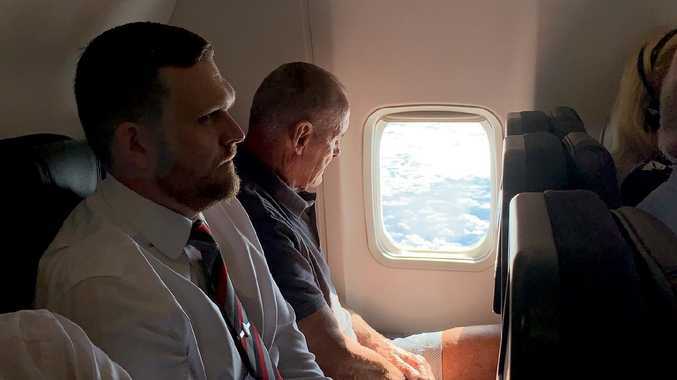 Yesterday, Dawson boarded a 7am Qantas flight from the Gold Coast to Sydney, where he was charged with the murder of his first wife, after decades of claiming the mother of his two young daughters simply ran away. Dawson sat on the plane, in the back left seat with two detectives wearing suits beside him. As passengers boarded - many aware of exactly who was sitting in that seat - Dawson remained expressionless, staring out the window. After Lynette went missing in 1982, Dawson said she had joined a religious cult in the Blue Mountains. He also claimed she went to the Central Coast with friends and never returned. Two days after Lynette disappeared, Dawson moved 16-year-old student Joanne Curtis into his home - and his bed. They would soon move to the Gold Coast, wed and have a daughter together, Dawson's third. As the flight began its hour-and-20-minute journey to Sydney, Dawson must have known whatever happens, there is disruption ahead. But that didn't take away his appetite, as he ate a tart made with free-range eggs. He stared out the window for most of the flight, fiddling with his phone. The flight landed about 9.20am Sydney time and despite thoughts that perhaps his chaperones would avoid more scrutiny by disembarking first, they were the last on board. Members of the media and the public snapped photos of him on their phones while Dawson remained stony-faced, showing little emotion. It almost seemed he was willing himself away from the situation, pretending he was elsewhere. After passengers were ushered off the plane, Dawson remained seated and expressionless. He was escorted down a set of stairs at the front of the plane and led to an unmarked blue sedan. Walking unhurriedly and seemingly unperturbed, he sat behind the front passenger seat. This is only the beginning of what is expected to be a very public case in a series of events that have torn apart families for almost four decades.